Yo Joe! It was a pretty solid weekend of predictions by me. I was not too far off in any of my predictions, and I predicted the top 5 films in order. G.I. 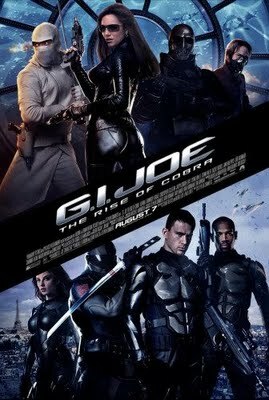 Joe: The Rise of Cobra led the box office this weekend with a gross of $56.2 million [I predicted $48 million]. With a superb per theatre average of $14,025, G.I. Joe: The Rise of Cobra grossed more than the next four films combined. As expected, the film did not do so well with critics, but the fanboys came out in full force to see their beloved action figures//animated series come to life on the big screen. We’ll see how well it holds next week. The film also benefitted from having no major action film released since Transformers: Revenge of the Fallen. The marketplace cried out for this kind of film. As I always say, marketing gets people into the seats on week one, so we’ll see if word of mouth can keep people coming back in week two. Opening in second place was Julie & Julia. The movie grossed $20.1 million [I predicted $25 million], and had an excellent per theatre average of $8,539. Females have had a decent summer for films targeted to them, and there was some thought that because so many films appealing to women have been released this summer, audiences might be burned out. Instead, Julie & Julia was effective counter-programming to G.I. Joe: The Rise of Cobra, and should have a decent run at the box office. In 3rd place is G-Force with $9.8 million [I predicted $10.5 million], and a per theatre average of $2,816. It was down 44% from last weekend, and its total gross stands at $86.1 million, so it will hit the $100 million plateau soon. You have to hand it to Disney and Jerry Bruckheimer, because no studio but them would have green lit a film about guerilla guinea pigs and expect it to make over $100 million. In 4th place is 2009’s third highest grossing film – Harry Potter and the Half-Blood Prince with $8.8 million [I predicted $9.8 million]. Down 50.4%, the film has grossed $273.8 million, and is the 4th highest grossing film in the franchise. It has the potential to be the 2nd highest grossing film in the series. $300 million is possible, but it will need some work. Only one Harry Potter film has grossed over $300 million and that was Harry Potter and the Philosopher’s Stone with $317.5 million (Although if you take inflation into account, it made much more). Dropping from 1st place to 5th place was Funny People with a gross of $7.8 million [I predicted $9 million]. The film dropped a disturbing 65.3% so audiences have given the film the thumbs down. Its total gross stands at $40.4 million, and with a budget of around $75 million, the film is definitely a disappointment. It will be interesting to see what Judd Apatow does for his next film. In other notes – A Perfect Getaway opened in 7th place with $5.7 million [I predicted $6 million], so it will be on DVD shelves soon. (500) Days of Summer finally cracked the Top 10 in its fourth week of release, with a gross of $3.7 million. In limited release, Paper Heart proved to be a little disappointing, grossing only $206,000 from 38 theatres. That is a per theatre average of only $5,421. Scott’s Top 5 predictions were off by $16 million. Next weekend brings us District 9 and The Time Traveler’s Wife.